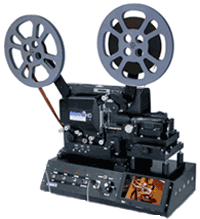 Full-HD transfer for your 8mm and 16mm films, at the price of an DVD transfer! Especially in case of a high-quality digitization. If, in light of all the advantages offered by our process, you are expecting a high price, you'll be delighted: despite asynchronous frame-by-frame capture and despite native Full-HD, our prices fall right in with conventional offers. Matter-of-course items, like careful 2-phase cleaning, antistatic treatment, broken splices or incorrectly rewound reels, can quickly ruin a suppsedly hot price. With us, they are already included. Prices also include 19% German VAT. Freight is extra. Depending on its playback speed, 100 meters of Super8 could run for 18, 24 or even 27 minutes. Billing per minute, the same length of film could thus result in three different prices! Since our asynchronous system captures at a constant speed, our prices are based on the actually digitized number of images. File-speed is added during the render process and thus hardly enters into the price calculations. 16mm film places higher demands on cleaning, splicig and handling, but since it has fewer images per meter, its price lies somewhat under the 8mm price. 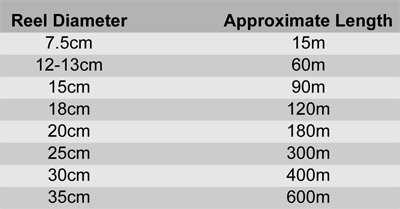 This table allows a guesstimate of your film lengths. Clearly, the final bill is based on precise data provided by our system during the capture. Handling these small reels is relatively impractical. Moreover, cleaning is not as effective. Therefore, we combine up to eight of these reels onto a new 120m (400ft) reel with box and charge €17.95 for the splicing and reel. Prices indicated as € per Meter. AVI-1: Pure 1:1 digital copy without speed adjustment. This can be done during playback or while editing. Recommended, when different film-speeds could have been used. AVI-2: Speed has been adjusted to 25fps (24p on request). Ideal, when you don't want to spend too much time on the films right now. Since one 120m reel of films requires about 10-12GB of storage, hard drives are indicated. Small 2.5" USB drives (power from the USB port) are fine for transport but too slow for editing, etc. Thus we recommend a 3.5" USB3.0 drive for its future benefits in speed. We accept these only, when already formatted to NTFS. Please note that the net capacity is always less than indicated. 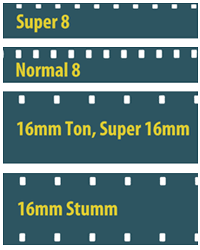 Super-8 sound films (magnetic) are captured at the original 16 or 24fps.We capture the main sound track only. Second sound tracks can be digitized on demand for €0,50 per Minute. 16mm films only with optical sound.